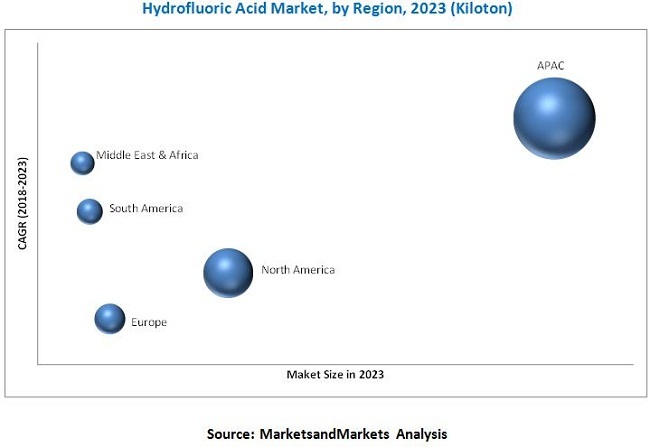 [114 Pages Report] Hydrofluoric Acid Market was valued at 1.6 million tons in 2018 and is projected to reach 2.1 million tons by 2023, at a CAGR of 5.5% during the forecast period. The base year considered for the study is 2017, while the forecast period is from 2018 to 2023. The top-down and bottom-up approaches were used to estimate and validate the size of the hydrofluoric acid market and to estimate the size of various other dependent submarkets in the overall market. This research study involved the extensive use of secondary sources, directories, and databases such as Hoovers, Bloomberg, Chemical Weekly, Factiva, and other government and private websites to identify and collect information useful for a technical, market-oriented, and commercial study of the hydrofluoric acid market. The supply chain of the hydrofluoric acid market starts with the sourcing of raw materials, followed by the manufacturing of hydrofluoric acid, processing of hydrofluoric acid, and supplying of finished hydrofluoric acid products. It ends with the use of hydrofluoric acid in various end-use applications. 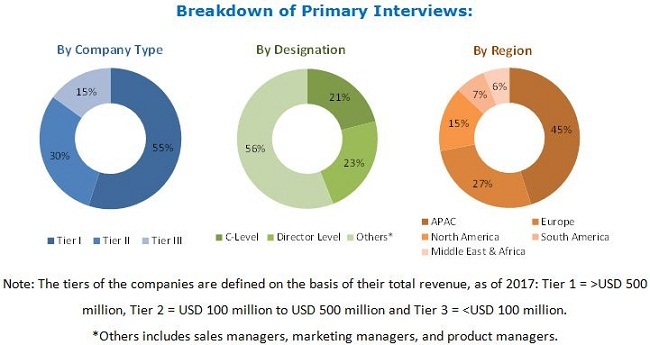 Major players in the market are Honeywell International (US), Daikin (Japan), Solvay (Belgium), Dongyue Group (China), Mexichem (Mexico), Sinochem Group (China), LANXESS (Germany), Yingpeng Group (China), Fluoride Chemical (China), and Fluorchemie Group (Germany). This research report categorizes the hydrofluoric acid market on the basis of grade, application, and region. Primary and secondary sources along with MnM repository were used to identify and determine above necessary data. Fluorocarbons are the major types of refrigerants used, globally. It is sub-divided into three types, namely, HCFCs, HFCs, and HFOs. Europe has already phased out HCFCs, and North America is in the process of phasing them out. According to the Montreal Protocol, HCFCs have to be completely phased out by 2030 in non-article 5 parties and by 2040 in article 5 parties. This has resulted in the use of alternatives, such as HFCs and HFOs, which have zero ODP. Hence, fluorocarbon production is expected to remain the dominant application of hydrofluoric acid during the forecast period. Hydrofluoric acid is used as a precursor to produce several fluorinated derivatives such as fluoride, fluoropolymers, and fluorosurfactants. The significant fluorides produced using hydrofluoric acid are Na3AlF6 and AlF3. These fluorides witness high demand from the steadily growing aluminum industry. The increasing production of fluorides is expected to propel the demand for hydrofluoric acid, globally. Hydrofluoric acid has a property of dissolving oxides and other impurities, and, hence, used at several stages in the processing of metals such as carbon steel, stainless steel, and titanium. It is also used to separate essential metals from mineral ores and wet etching and cleaning of non-ferrous metal pieces. The growing metal industry, globally, is expected to increase the demand for hydrofluoric acid in metal pickling application. Hydrofluoric acid is used as glass etching agent in the manufacturing of glass substrate, silicon nitride, and silicon dioxide for the thin-film transistor (TFT) - liquid-crystal display (LCD) and semiconductor industries owing to its ability to dissolve silicates. Which are the raw materials used for production of hydrofluoric acid? How will their price change have effect on the market? Most of the producers have adopted expansion as the key strategy as could be seen from the recent developments. Where will it take the industry in the forecast period? What are the hazardous effects of the hydrofluoric acid? What are the regulations on the use of fluorocarbon refrigerants in different regions? Hydrofluoric acid market is expected to grow with the growing applications, globally? The hydrofluoric acid market is estimated to be 1.6 million tons in 2018 and projected to reach 2.1 million tons by 2023, registering a CAGR of 5.5% between 2018 and 2023. The growing demand for hydrofluorocarbons (HFCs) and hydrofluoroolefins (HFOs) and increasing demand for fluorine compounds in several industries are the major drivers of the global hydrofluoric acid market during the forecast period. The hydrofluoric acid market is classified into three grades: anhydrous hydrofluoric acid (AHF), diluted hydrofluoric acid (above 50% concentration) and diluted hydrofluoric acid (below 50% concentration). AHF is the most widely used grade of hydrofluoric acid owing to its extensive use in the fluorocarbon production and fluorinated derivative production applications. 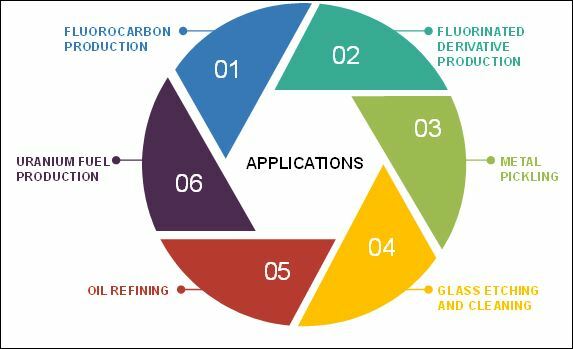 By application, the hydrofluoric acid market is classified into seven segments, namely fluorocarbon production, fluorinated derivative production, metal pickling, glass etching and cleaning, oil refining, uranium fuel production, and others. Fluorocarbon production is the largest application of hydrofluoric acid due to the extensive use of hydrofluoric acid in the manufacturing of fluorocarbons. The increased demand for fluorocarbons is expected to drive the hydrofluoric acid market during the forecast period. 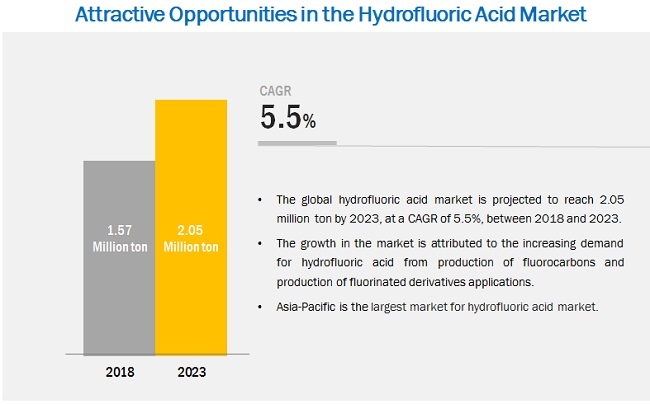 Asia Pacific is estimated to be the largest market for hydrofluoric acid and is projected to register the highest CAGR during the forecast period due to the presence of numerous fluorocarbon manufacturers in the region. China is expected to account for the largest share of the market in Asia Pacific until 2023. Major producers of hydrofluoric acid, such as Dongyue Group (China), Daikin (Japan), Sinochem (China), Yingpeng Chemical (China), and Fluoride Chemicals (China), are located in the Asia-Pacific region. North America accounts for the second-largest share of the global hydrofluoric acid market. Fluorocarbon production is the dominant application area of hydrofluoric acid. However, various governments and agencies are imposing regulations to limit the use of fluorocarbon refrigerants due to its adverse effect on the ozone layer. Several countries have agreed to phase out the use of hydrochlorofluorocarbons (HCFCs) and hydrofluorocarbons (HFCs) by imposing protocols and regulations to limit their consumption. Hence, the stringent regulations on the use of fluorocarbon refrigerants is one of the major factors expected to restrict the growth of the market. Companies are using the expansion strategy to increase their geographical presence and cater to the increasing demand for hydrofluoric acid products. For example, Dongyue Group used expansion as its major strategy to increase its presence in China. In November 2017, Dongyue Group inaugurated two companies, namely, Shandong Dongyue Public Trading and Guoming Investment Management, in Beijing, China. These companies are involved in trading commodity products, such as chemical products, non-ferrous metals, ferrous metals, and investments in production and financing. This expansion has allowed the company to expand its presence in China. 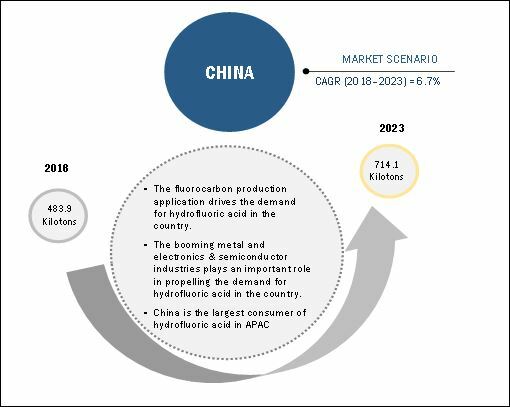 Companies such as Dongyue Group (China), Honeywell International (US), and Daikin (Japan) adopted the expansions strategy to expand their production capacities and market share in the hydrofluoric acid market between 2016 and 2018. Hydrofluoric acid is a clear, colourless, fuming liquid with a sharp, pungent odour. It is widely used in the chemical industry to produce fluorine compounds such as fluorocarbons, fluorides, and fluoropolymers. Fluorocarbons such as hydrofluorocarbons (HFCs), and hydrofluoroolefins (HFOs) are the major types of refrigerants used, globally. Therefore, increasing demand for refrigerants is expected to propel the fluorocarbon production, thereby driving the hydrofluoric acid market. Fluorides, such as sodium hexafluoroaluminate (Na3AlF6) and aluminum trifluoride (AlF3), are used in aluminum production, globally and are witnessing high demand from aluminium industry. In addition, sodium fluoride and uranium hexafluoride have gained importance in the production of pharmaceuticals and uranium, respectively. Apart from this, the growing demand for fluoropolymers from the automotive and electronics & semiconductor industries is expected to increase the need for hydrofluoric acid to produce them. 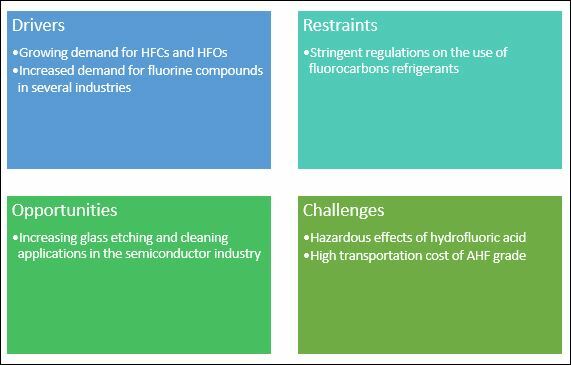 Thus, the high demand for fluorine compounds from several industries plays a crucial role in driving the hydrofluoric acid market. Fluorocarbon refrigerants adversely affect the ozone layer of the atmosphere; therefore, various governments and agencies are imposing regulations to limit the use of fluorocarbon refrigerants. Several countries have agreed to phase out the use of HCFCs and HFCs by imposing protocols and regulations to limit their consumption. These protocols and regulations restrict the production and consumption of fluorocarbon refrigerants, which directly restrict the market growth of hydrofluoric acid. According to the Montreal Protocol, HCFCs have to be phased out entirely by 2030 in non-article 5 parties and by 2040 in article 5 parties. It’s also necessitated that HFCs must be phased out completely by 2033 in non-article 5 parties and by 2043 in article 5 parties. Fluorocarbon production is the dominant application area of hydrofluoric acid. Hence, the restrictions and limitations on the use of fluorocarbon refrigerants are expected to restrict the growth of the market.